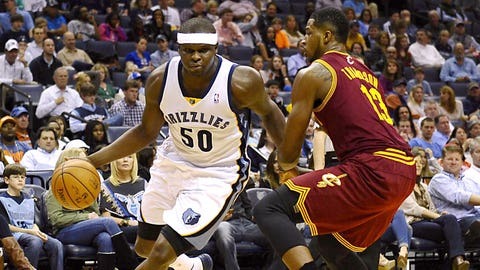 Zach Randolph (50) finished with 23 points and 14 rebounds. MEMPHIS, Tenn. (AP) — Zach Randolph had 23 points and 14 rebounds, and the Memphis Grizzlies used a big second half to defeat the Cleveland Cavaliers 110-96 Saturday night. Randolph had 17 points in the second half to help Memphis outscore Cleveland 56-31 and rally from an early 15-point deficit to win its fifth straight at home. Mike Conley and Marc Gasol scored 22 each for the Grizzlies. Conley added seven assists and Gasol had six. Courtney Lee finished with 19 points and Tony Allen had 16 on 7-of-10 shooting. Kyrie Irving led the Cavaliers with 28 points on 11-of-19 shooting, while Tristan Thompson was 8 of 10 for 18 points. Spencer Hawes had 13 points and Luol Deng 11. Memphis took control with a big third quarter and led by 91-83 with 8:56 left in the fourth. The Cavaliers used six straight points from Irving to pull within 95-94 with 4:03 left. But a baseline 8-footer by Randolph and a 3-pointer from Conley restored Memphis’ cushion. By the time Gasol scored on a hook shot with 1:13 left the Grizzlies’ lead was in double digits. The Cavaliers dominated the first half, leading by as many as 15 points and taking a 65-54 lead into the break. The Grizzlies provided little resistance and Cleveland shot just under 70 percent for much of the half before going to the locker room at 61 percent, including connecting on 4 of 9 from outside the arc. That included 6 of 7 from the field by Thompson, who led Cleveland with 14 points. Irving had 13, while Hawes provided long-range offense, connecting on all 3 of his 3-pointers in his 11 first-half points. Gasol had 15 points, Lee 11 and Allen 10 for the Grizzlies, who were at 52 percent shooting and still trailed by double digits at the break. The energy and intensity increased for Memphis to open the second half and that translated into a 21-8 run to overtake Cleveland just past the midway point of the third. At that point, Cleveland had committed five turnovers in the quarter. Memphis eventually would take the run to 26-8 for an 80-73 lead. Led by 13 points from Randolph, the Grizzlies outscored Cleveland 33-15 in the third and carried an 87-80 lead into the final frame. Cleveland would commit seven turnovers in the third alone and hit 6 of 16 shots. NOTES: Irving has scored at least 20 points in 17 of last 23 games. . The Cavaliers’ 65 points in the first half were the most scored by a Memphis opponent in a half this season. The previous high was 62 in the second half by Dallas on Nov. 2. . Gasol hit a shot at the end of the first quarter from beyond half court and banked it in. It was shown on the score sheet as 60 feet. It was his first 3-pointer of the season. . The Cavaliers have lost four straight road games in the series. They last won in Memphis on Jan. 13, 2009. . The game was the nightcap of a doubleheader at the FedExForum. Earlier in the day, No. 21 Memphis defeated seventh-ranked Louisville 72-66.